When will our leaders learn? Last month, the large conversation was around GST. The country was preparing for a big transition from one indirect taxation structure to another taxation structure. Ideally, it should have been a simple affair of a switchover. But as it happens in India, the whole buzz leading to the switchover was anything but smooth. The amount of jokes that sprung up on GST must have increased the bandwidth consumption in India by many gigabytes. The markets went on GST sale, the brands made special offers, they created the GST price protection plans, the constantly on sale ecom portals had one more reason to stay on sale. The country had a shopping festival this year that may have been bigger than the coming Diwali. There is one brand that may have won the entire GST hullabaloo; that brand is Durex. 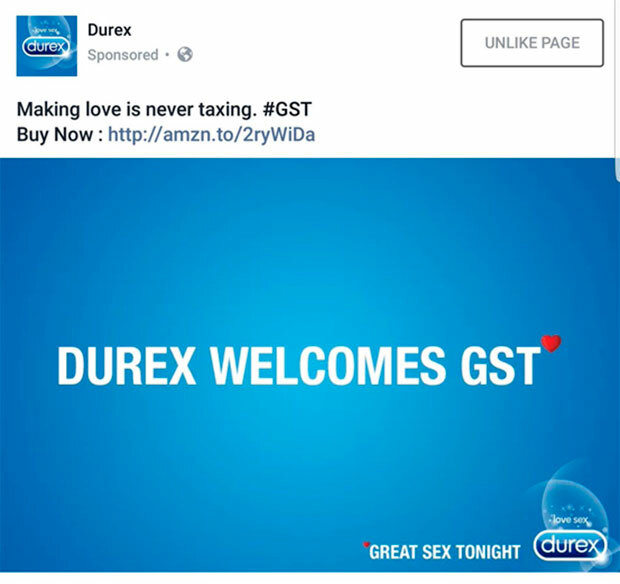 In a clever cheeky post on Twitter, Durex usurped the entire GST conversation. Clever from Durex. Wonder why no other brand has a take on GST? In the lead-up to GST, the Government of India did release a high pressure, high intensity campaign across the country. Whether all of the ads were thought through and whether the live event had everything correct is really up for debate. The countrywide press ad was poorly crafted and badly written. This is unlike what this Government has done till now, their ads have been sharp and well made. Here’s the launch ad and you can have your own take on the headline. The switchover from the previous system to the new system was beamed live to the whole country, but did the PM walk away to theme music of Darth Vader? The public broadcaster obviously is poorly trained on small intricacies of music and movies. The bigger issue though is one voice that has become the voice of the Government. You will hear this very well-known and loved baritone across the Swachh Bharat Mission, Pulse Polio Mission, Hepatitis, GST and possibly more in quick succession on Radio. It’s not Mr Bachchan’s fault that he comes across sounding similar in all the ads. The creative teams of all the causes that Government pushes have used him in a singular way. 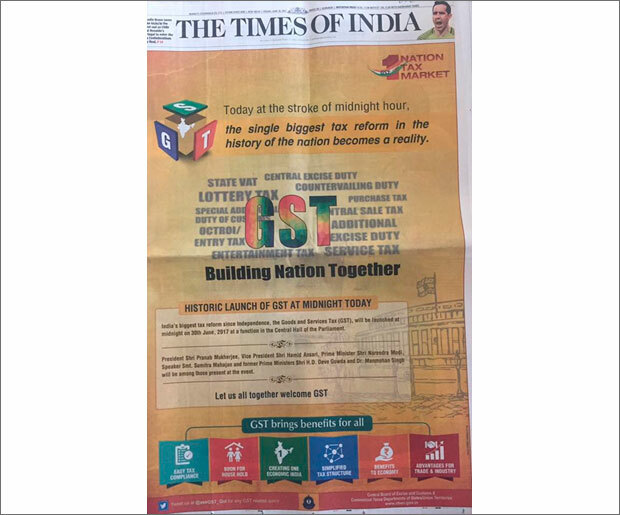 The similar sounding tonality across all the ads should be a cause of worry as it does impact the memorability of the campaigns. For the advertising-savvy government, this is one blip it must correct quickly. Mr. Bachchan may be a great choice, but he needs to be used in creatively vibrant ways. Apart from all the pressure of advertising from the Government and switchover of the taxation structure, MP Birla cement released a high on emotion campaign where they tried to go beyond the usual appeal of cement brands. MP Birla Cement is a rather unusual brand name for a brand trying to create consumer appeal, the advertising though is rather nice. Here is the ad that talks about how making a house in India is such a tough task. The emotional overlay of sacrifices a family makes in making the house is then connected to not just the quality of cement but also to expert advice on usage of cement. Trying to create appeal for an intermediate product like cement is a tough task, and strength is the dominating appeal. MP Birla is adding the angle of expertise. In the long run, this may turn out to be differentiator, especially of the expertise angle that is rolled in a big way for the end consumer. Staying with cement, the ad of the month for me comes from Japan. Japan is the master of ludicrous advertising, but sometimes there are ads that cross over to become insanely mad. Here’s a commercial where the actors are screaming and shouting and while watching you are trying to guess the category. It’s really an odd way of advertising for a boring category but is done with such quirk that it is impossible to ignore the ad. The ad did very well at Cannes this year. So did Durex with the clever tweet.